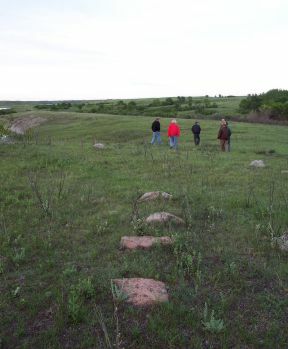 Selected photographs with explanatory cutlines from the Moncur Gallery's explorations of sites around Turtle Mountain. A party of volunteers ends the day after walking a section of land along the Chain Lakes. Like Pelican Lake, the Chain Lakes are part of the ancient Pembina trench formed by a giant river which drained the retreating glacier seven to eight thousand years ago. Lying roughly along the solstice angle, the Chain Lakes form the natural centre of a giant medicine wheel complex six miles long by a mile wide. This area, rich in wildlife, has probably been a favourite camping and ceremonial site since about 7,000 BC.